U.Va. 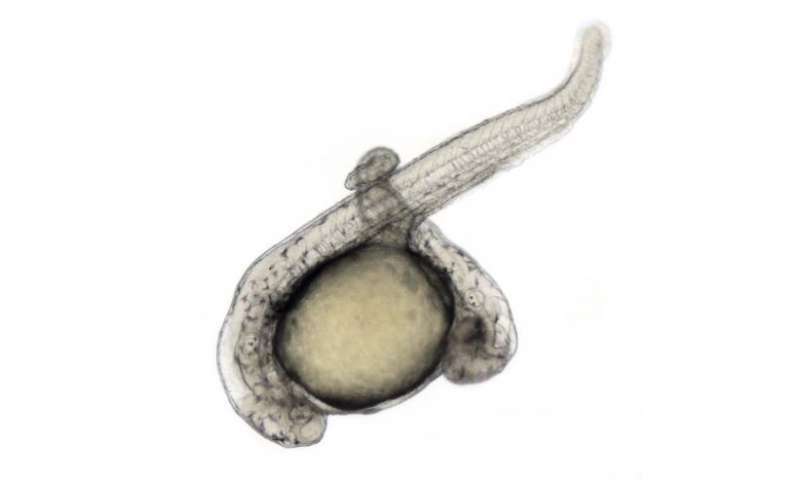 scientists Bernard and Chris Thisse have created a zebrafish embryo by instructing stem cells. (Phys.org) —Scientists at the University of Virginia School of Medicine have overcome one of the greatest challenges in biology and taken a major step toward being able to grow whole organs and tissues from stem cells. By manipulating the appropriate signaling, the U.Va. researchers have turned embryonic stem cells into a fish embryo, essentially controlling embryonic development. The research will have dramatic impact on the future use of stem cells to better the human condition, providing a framework for future studies in the field of regenerative medicine aimed at constructing tissues and organs from populations of cultured pluripotent cells. In accomplishing this, U.Va. scientists Bernard and Chris Thisse have overcome the most massive of biological barriers. "We have generated an animal by just instructing embryonic cells the right way," said Chris Thisse of the School of Medicine's Department of Cell Biology. The importance of that is profound. "If we know how to instruct embryonic cells," she said, "we can pretty much do what we want." For example, scientists will be able one day to instruct stem cells to grow into organs needed for transplant. 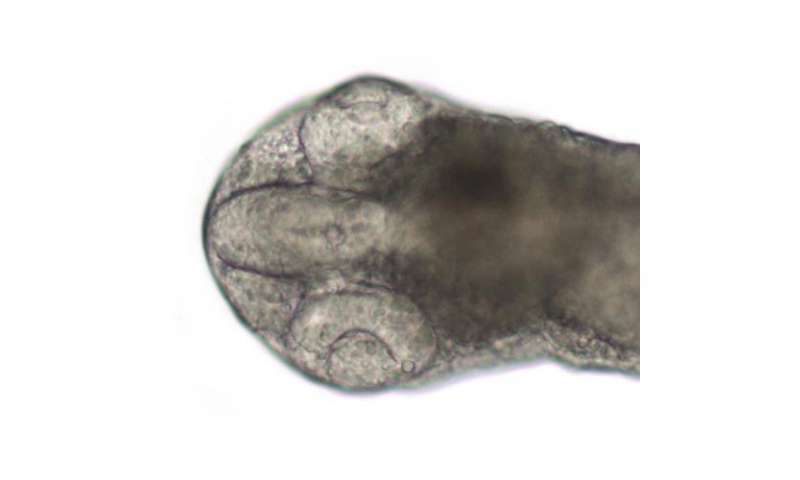 The researchers were able to identify the signals sufficient for starting the cascade of molecular and cellular processes that lead to a fully developed fish embryo. With this study came an answer to the longstanding question of how few signals can initiate the processes of development: amazingly, only two. Constructing a vertebrate embryo from two signals. 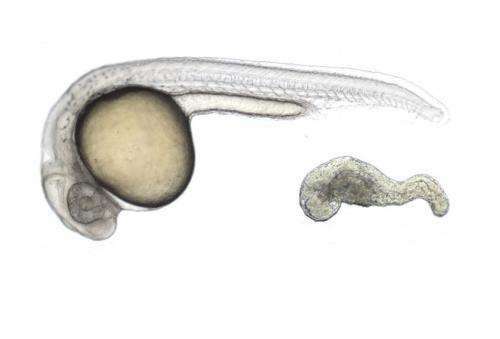 The study has shed light on the important roles these two signals play for the formation of organs and full development of a zebrafish embryo. Moreover, the Thisses are now able to direct embryonic development and formation of tissues and organs by controlling signal locations and concentrations. The embryo they generated was smaller than a normal embryo, because they instructed a small pool of embryonic stem cells, but "otherwise he has everything" in terms of appropriate development, said Bernard Thisse of the Department of Cell Biology. The brain of the vertebrate embryo built in vitro. Their next steps will be to attempt to reproduce their findings using mice. They expect molecular and cellular mechanisms will be extremely similar in mice and other mammals – including humans. The findings have been published online by Science and will appear in a forthcoming print edition of the prestigious journal. Just a matter of time before they grow a heart. I'm more interested in a brain. Considering the ultimate goal of reproducing bits and pieces of humans, I wonder how long it might be expected to take - growing some human organ from a stem cell? At a normal rate, it takes a decade or two to grow an adult human part - we don't mature as fast as fish. Wonderful accomplishment - now one wonders whether the process, stem-cells > pluripotential cells > organ regeneration, can also occur, not just by genetic manipulation, but by formative dynamics of consciousness. The researchers or the 'ethical police'? Long 'gestation' periods doesn't stop some from enjoying 50 year old scotch. Start now and in a couple of decades the organ farms will be ready for business, right? Pretty sure people will still need organs in 20 years. Maybe by genetic manipulation we could grow plants that look and taste like beef. Seems like that could be more resource efficient. Food manufacture will be one of those game changers in probably less than a decade. It has the absolute potential to eliminate hunger via economics rather than policy (which has an abysmal track record). Food will be the same way. I'm curious. Are you saying that proteins and amino acids need an immune system to grow? I'm clear on how a living organism with several systemic biological systems to maintain in an environment of pathogens needs an immune system. I'm not clear how proteins grown in a vat do. Muscle tissue isn't an organism, it's biological matter yes, but not anything close to even a simple organism. We need to grow a mammoth, and then a glyptodont, and then a terror bird, and then an archaeopteryx, and then a Neanderthal. Etc. I'm sure they will all be very happy to be alive. Hmmm.... A filet Mignon tree?